Cruises from Hawaii (Honolulu) make the most of the island’s beautiful beaches, lush jungle, volcanic rock and incredible cultural and natural attractions, offering a fascinating and relaxing destination worth exploring before your cruise. 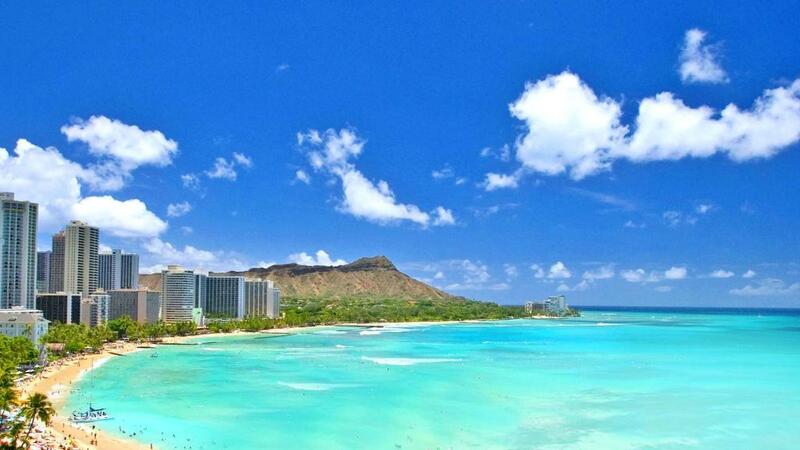 Taking in famous Waikiki Beach, cruises from Hawaii also offer views of the iconic Diamond Head. Cruises from Honolulu leave from Aloha Tower and either Pier 2 or Pier 11, conveniently located midway between Waikiki Beach and the airport. Situated in downtown Honolulu, the cruise terminal is the gateway to Hawaii’s flourishing, world-class holiday destinations and offers complimentary shuttle services to the nearby Walmart and Hilo Hatties. A hop-on hop-off trolley service also operates from Aloha Tower. The islands of Hawaii offer a wealth of attractions, each with its own unique activities and atmosphere. From Oahu’s famous cliffs of Diamond Head and iconic Waikiki Beach in Honolulu to the spectacular natural environment of the Garden Island of Kauai and the Big Island’s ancient active volcano, Hawaii is a popular cruise stop in the Pacific. One of Oahu’s most popular attractions, the Arizona Memorial and Pearl Harbour WWII tributes pay homage to the important historical events of Pearl Harbour and the military personnel who sacrificed their lives in the attack. Featuring a guided tour, short boat trip, 23 minute documentary and plenty of free time to explore at your leisure, the memorial provides an insight into the events of that fateful day. If you have time to head to the Big Island you can’t miss its main attraction, an active volcano. Located in the Volcanoes National Park, it encompasses the world’s most active volcano – the summit of Kilauea. The park is one of the most visited attractions in Hawaii and also features the largest volcano in the world, Mauna Loa. Over on the naturally beautiful island of Kauai you’ll find what’s considered the ‘Grand Canyon of the Pacific’, Waimea Canyon. With striking views by air or land, the canyon measures 1.6km wide, 16km long and 3,600 feet deep and boasts some of Hawaii’s most dramatic waterfalls. The awe-inspiring natural attraction is adorned with striated rock which creates colourful layers and features some breathtaking walking paths that lead to the Kalalau Valley Lookout and incredible views of the Na Pali coast. Of course no holiday to Hawaii would be complete without experiencing the traditional celebration feast known as the luau. A number of these are offered throughout the islands but some of the best include the Paradise Cove Luau and the luau offered at the Polynesian Cultural Centre, a collection of cultural villages set on a river and showcasing the many islands of the Pacific.